You may have recently read an email or posting from Matt MacCurdy about Kelsang Khyentse, the Building Manager of Manjushri KMC. We know Khyentse very well. Khyentse himself has told people that before he met Dharma, he had angry behaviour. He has said that since he met Dharma and became a member of the NKT community, he has pacified his previous anger problem and has found a peaceful and meaningful life. Khyentse helped to build the Temple at KMC New York for many years. There were no problems and people were happy with him. Then he worked on the building projects at KMC France, KMC Germany and KMC Spain for several years – again there weren’t any problems and people were happy with him. Normally as the Building Manager here at Manjushri KMC, Khyentse works with groups of people and again everyone is happy with him. So we understand that Khyentse is telling the truth when he says that through meeting Dharma, he has pacified his previous anger problem. Unfortunately this year in Brazil, two things happened — Khyentse had very heavy responsibility for the Temple building project with tight completion deadlines and also some people caused him to become angry. Because of this, his previous angry behaviour returned. We are very sorry that this happened. As NKT Managers we are now asking Khyentse to please maintain a peaceful mind, and we are also trying to prevent other people from causing his anger to return. In this way we believe that such problems can be avoided in the future. Kelsang Pema has been asked to step down as NKT-IKBU Temple & KMC Development Director by the Directors of the Charity because she was no longer performing all the functions of her office in accordance with the Internal Rules. 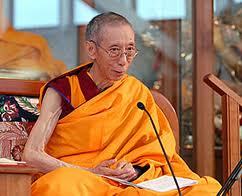 New Kadampa Truth would like to thank Pema for her sincere work for the NKT-IKBU. We wish her every good health, happiness, and delight in her Dharma practice. The Directors of the Charity have appointed Kelsang Rabchog, formerly administrative director of Manjushri KMC, to take her place. Stephanie Atkinson, formerly director of Tharpa Publications UK, is the new administrative director for Manjushri KMC. Peter Davis is the new director of Tharpa Publications UK. It is with a heavy heart and regret that I tender my resignation as GSD. I am unable at present to continue the duties of GSD due to poor health and I am therefore asking if you will accept this resignation. Gen-la Khyenrab’s resignation was accepted and he will be returning to his previous position (prior to becoming Deputy Spiritual Director) of Resident Teacher of Tara Kadampa Meditation Centre in Derby, UK. We at New Kadampa Truth would like to express our deep gratitude to Gen-la Khyenrab for his kind spiritual guidance, sincerity, deep experience, and constant good humour during his years as Deputy Spiritual Director (DSD) and his eight-month tenure as GSD; and we are sad to see him go. No doubt the students of Tara KMC will benefit greatly from his wisdom and experience, and we all look forward to receiving teachings from him again in the future. Those in North America do not have to wait long, as he is still teaching the US Festival at KMC New York at the end of this month. In accordance with Internal Rule 5.8, retired GSDs can be invited back to teach at Festivals. In accordance with Internal Rule 5.9, the serving Deputy Spiritual Director (DSD), Gen-la Dekyong, has now automatically become the new GSD and vacated the office of DSD and of North American National Spiritual Director (NSD). Gen-la Dekyong has happily accepted this responsibility, even though it is earlier than she had anticipated. She will be moving to Manjushri KMC to begin this position immediately. Due to the vacation of the office of DSD, in accordance with Internal Rule 5.10, the continuing Directors of the NKT-IKBU and the main executive officers of the Charity recommended Gen Kunsang of KMC Mexico to become the new DSD, and she was duly elected by a majority vote of all the members of the Education Council of the NKT. Gen-la Kunsang has the qualifications required for a DSD as stated in the Internal Rules. She is a senior student of the NKT and has served as a very successful Resident Teacher in several countries. Prior to being elected as DSD, Gen Kunsang served as Resident Teacher of KMC Mexico and held the position of the NKT National Spiritual Director for Mexico. She is fluent in three languages — German, English, and Spanish. Gen-la Dekyong, as GSD, will grant the empowerment of Enlightened Mother Arya Tara and give commentary to the practice at the NKT-IKBU International Spring Festival at Manjushri Kadampa Meditation Centre at the end of May. Both Gen-la Dekyong and Gen-la Kunsang will be granting empowerments and giving teachings at the NKT-IKBU International Summer Festival in July. These are wonderful events that we can all look forward to. Finally, the new NSD for North America (replacing Gen-la Dekyong) is Gen Jampa of KMC Texas. Gen Rigpa is the new RT at KMC California and Kelsang Norbu is the new teacher (replacing Gen Rigpa) at Drolma Center in Fort Lauderdale! Let us know if you have any questions about any of these developments.